These days almost all the businesses and individuals use computers for their work. In such scenario, it becomes necessary for us to know about computer accessories and other related things to become more efficient while keeping low on costs. Same is the case with printers. When we talk about them, we have more than one option such as inkjet printer and laser printer. Inkjet printers use ink cartridges, whereas laser printers require toner cartridges. These two are very different from each other. An inkjet cartridge contains liquid ink that is available in four colors including black, blue (cyan), yellow, and magenta (red). The cartridge can have one or more chambers that store ink in sponge and disperse it through holes. A laser toner is fine carbon-based powder mixed with a polymer that is stored in a “hopper” chamber. In an inkjet printer, ink is injected into an access hole through a syringe bottle, whereas toner is poured directly from a bottle into the hopper. Filling ink in inkjet printer is little risky as you need to locate a hole to inject ink, otherwise it can spill outside and ruin the printer. Refilling a laser printer is relatively easier. An inkjet printer sprays ink on to the paper and can print high-quality graphics. In a laser printer, toner sticks to the surface of paper in a particular pattern and creates the texts and images on it. The choice of cartridges depends on the model of your printer and your personal needs. Both inkjet and toner cartridges have their own advantages and disadvantages. They are completely different from each other and a little knowledge about them can help you make the right choice. 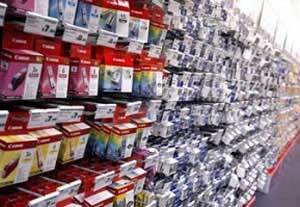 Inkjet printer cartridges are usually preferred because of their low cost. Inkjet printer is user-friendly and is very easy to handle. They are capable of printing in four main colors including blue, black, magenta, and yellow, and they print high-quality graphics. Inkjet printers are good for non-professional, low-volume needs, and home use. Though inkjet printers are very easy to use, their slow printing speed is their main drawback. Another main disadvantage is that inkjet cartridges have a tendency for the ink to smudge. That can ruin the whole paper. They are not ideal for office use or for high-volume needs. They require good quality paper for proper printing. Cheaper or low-quality paper cannot be used. Refilling an inkjet printer is not easy. Toner cartridges offer high resolution. It depends on particle size of the toner. The smaller the particles, the better the resolution. They have long life and are very efficient. Laser printers can hold a substantial amount of toner at one time and print at least 5000 pages. Laser accessories last long and laser printers can print on low-quality or cheap paper. The inkjet printer cartridges are good for non-professional and home use, whereas toner cartridges are ideal for official and high-volume needs. very simple and straight post. Thanks for sharing. This post is really helpful for me and others who use Printers and toners.